Welcome to March! The month of the start of spring, my birthday, and St. Patty’s Day! Kicking off an Irish theme until the big green day, here’s a fun little recipe perfect for breakfast or anytime! Preheat oven to 385 degrees. Combine dry ingredients, then add in the wet. Pour into a small baking pan, loaf pan, or 1-cup ramekin. 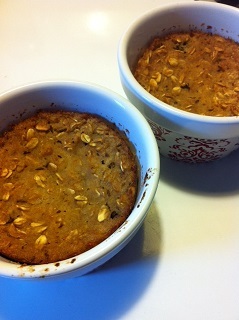 Or you can use two 1/2-cup ramekins for baby oatmeal cakes. Cook for 20 minutes, or until firm. Finally, set your oven to “high broil” for 3 more minutes, or until desired crispy-ness is reached (or simply just bake longer, but broiling gives it a nice crust). Makes 2 carb servings. Pair with eggs for a complete breakfast or serve after a protein/veg dinner as a not-too-sweet dessert. Feast Irish, feast on oatmeal, and as always…FEAST ON!! !